Your basal metabolic rate, or BMR, is the minimum calorific requirement needed to sustain life in a resting individual. It can be looked at as being the amount of energy (measured in calories) expended by the body to remain in bed asleep all day! BMR can be responsible for burning up to 70% of the total calories expended, but this figure varies due to different factors (see below). Calories are burned by bodily processes such as respiration, the pumping of blood around the body and maintenance of body temperature. Obviously the body will burn more calories on top of those burned due to BMR. Genetics. Some people are born with faster metabolisms; some with slower metabolisms. Gender. Men have a greater muscle mass and a lower body fat percentage. This means they have a higher basal metabolic rate. Age. BMR reduces with age. After 20 years, it drops about 2 per cent, per decade. Weight. The heavier your weight, the higher your BMR. 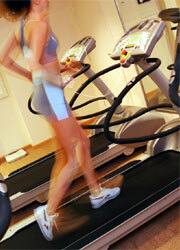 Example: the metabolic rate of obese women is 25 percent higher than the metabolic rate of thin women. Body Surface Area. This is a reflection of your height and weight. The greater your Body Surface Area factor, the higher your BMR. Tall, thin people have higher BMRs. If you compare a tall person with a short person of equal weight, then if they both follow a diet calorie-controlled to maintain the weight of the taller person, the shorter person may gain up to 15 pounds in a year. Body Fat Percentage. The lower your body fat percentage, the higher your BMR. The lower body fat percentage in the male body is one reason why men generally have a 10-15% faster BMR than women. Diet. Starvation or serious abrupt calorie-reduction can dramatically reduce BMR by up to 30 percent. Restrictive low-calorie weight loss diets may cause your BMR to drop as much as 20%. Body Temperature/Health. For every increase of 0.5C in internal temperature of the body, the BMR increases by about 7 percent. The chemical reactions in the body actually occur more quickly at higher temperatures. So a patient with a fever of 42C (about 4C above normal) would have an increase of about 50 percent in BMR. External temperature. Temperature outside the body also affects basal metabolic rate. Exposure to cold temperature causes an increase in the BMR, so as to create the extra heat needed to maintain the body's internal temperature. A short exposure to hot temperature has little effect on the body's metabolism as it is compensated mainly by increased heat loss. But prolonged exposure to heat can raise BMR. Glands. Thyroxin (produced by the thyroid gland) is a key BMR-regulator which speeds up the metabolic activity of the body. The more thyroxin produced, the higher the BMR. If too much thyroxin is produced (a condition known as thyrotoxicosis) BMR can actually double. If too little thyroxin is produced (myxoedema) BMR may shrink to 30-40 percent of normal. Like thyroxin, adrenaline also increases the BMR but to a lesser extent. Exercise. Physical exercise not only influences body weight by burning calories, it also helps raise your BMR by building extra lean tissue. (Lean tissue is more metabolically demanding than fat tissue.) So you burn more calories even when sleeping. Illnesses such as a fever, high levels of stress hormones in the body and either an increase or decrease in the environmental temperature will result in an increase in BMR. Fasting, starving or malnutrition all result in a lowering of BMR. This lowering of BMR can be one side effect of following a diet and nothing else. Solely dieting , i.e. 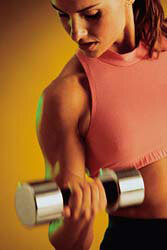 reducing the amount of calories the body takes on, will not be as affective as dieting and increased exercise. The negative effect of dieting on BMR can be offset with a positive effect from increased exercise. This is a very easy way to estimate caloric needs, but there are obvious drawbacks to this method because it doesn't take into account activity levels or body composition. Extremely active individuals may require far more calories than this formula indicates. In addition, the more lean body mass one has, the higher the TDEE will be. Because body fatness is not accounted for, this formula may greatly overestimate the caloric needs if someone is extremely overfat. For example, a lightly active 50 year old woman who weighs 235 pounds and has 34% body fat will not lose weight on 3000 calories per day (235 X 13 as per the "quick" formula for fat loss).